Results: You might think that watching ice melt is pretty dull, but at the Pacific Northwest National Laboratory, Pennsylvania State University, and Peking University, scientists are studying ice to explain a bizarre situation: ice generating an electrical charge. The team has been studying ice at temperatures normally found on the surface of Pluto, about 40 Kelvin, and watching what happens as it warms up to a "balmy" 185K, the coldest temperature ever recorded on Earth. "Water refuses to be boring," said Dr. James Cowin, the project's leader and a research scientist at PNNL. To the team's surprise, they found that the ice generated voltages as large as that in the battery in your TV's remote control, at temperatures between 30K and 150K. Water experts predicted nothing would happen, as at these temperatures, the water molecules cannot even rotate, just wiggle slightly. Why it matters: This research corrects a fundamental misunderstanding regarding ice. The electrification of ice could have been critical to the sticking together of icy grains of dust in our early solar system, to form comets and planet, and to drive the chemistry in them to supply amino acids to our young earth. Methods: Using resources at the Department of Energy's EMSL, a national scientific user facility at PNNL, the team from PNNL, Pennsylvania State University, and Peking University began by preparing 1-micrometer-thick films of ice. Building the films starts with a single platinum crystal, which has the desired molecular spacing for growing ice crystals. Next, the team deposited water molecules onto the platinum at temperatures ranging from 30K to 150K. On top of the ice films, the researchers gently deposited positively charged cesium atoms or hydronium, the latter composed of three hydrogen atoms and an oxygen atom. Next, the team measured the voltage across the film using a Kelvin probe, a simple and elegant method of measuring voltage without touching the ice. The researchers measured the voltage on the ice as the temperature was changed from 150K to 30K and back. The voltage swung from +10 volts to 0 volts and back again. This "ice battery" was eventually explained via computer simulations. Each water molecule can act like a miniature 1-volt battery. The team got about 10% of the water molecules aligned in their films. The wiggling of the molecules' alignment caused by the heating then generates the voltages. 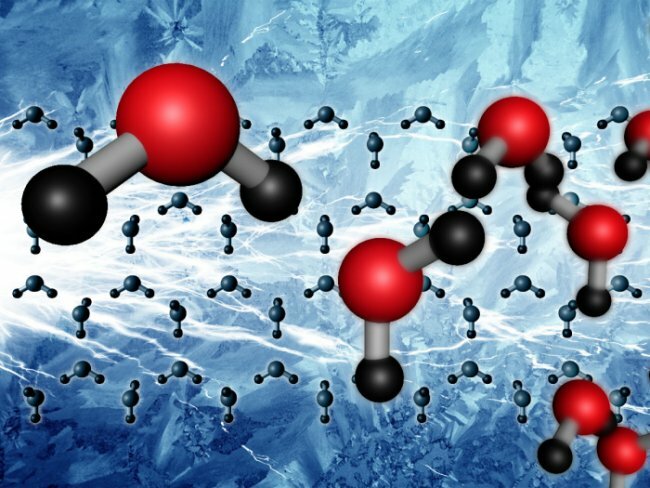 If the researchers could get all the molecules aligned the same way, these ice films, being around 3000 water molecules thick, could generate thousands of volts. "You don't expect an ice cube to push charge around," said Dr. Gregory Schenter, a PNNL scientist who modeled the experimental results. What's next: Having thoroughly enjoyed seeing their research mentioned in Nature and an astrophysics journal, the team members are now working on other projects focused on water and ice, particularly in clouds. Acknowledgments: The Offices of Basic Energy Sciences and Biological and Environmental Research within DOE funded this research. The research is part of PNNL's work to strengthen U.S. scientific foundations for innovation by developing tools and understanding required to conduct chemical and physical processes in complex multiphase environments. The research was conducted by an interdisciplinary team of experts. The members of the team are Hanfu Wang, Martin J. Iedema, Gregory K. Schenter, and James P. Cowin at PNNL, Richard C. Bell at Pennsylvania State University, and Kai Wu at Peking University. The research used DOE's EMSL, a national scientific user facility at PNNL.